I was first introduced to the Steamy Kitchen blog by Jaden Hair last year. I instantly became a fan of hers for a few reasons. I love cooking Asian cuisine and her recipes are healthy and very easy to follow. I have never once been intimidated by any of her recipes. Jaden also resides a few miles from Tampa and there is nothing I love more than supporting fellow Tampa food bloggers. When I heard Jaden was writing a cookbook, I was very excited for her. 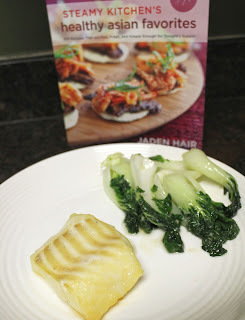 My friends at #SundaySupper dedicated this week to Jaden and Steamy Kitchen for the launch of her cookbook. I gladly accepted to be one of the twenty bloggers selected to receive her cookbook AND give one away to one of my readers! We were offered nine recipes to make this week and I did something very out of the box for me. I decided on the Miso Cod - which happens to be a fish I have never prepared at home, marinated in Miso, something that I have never cooked with. I went to my local ethnic food store and searched the spice aisle for 20 minutes looking for miso - I finally asked for help, to find out it is located in the refrigerated section. Oops. Truth be told, I had no idea what Miso was. Along with my miso, I grabbed a beautiful batch of baby bok choy, some fresh ginger and other goodiess. Upon arriving home, I flipped through Jadens cookbook and dog eared more pages than I have ever done in any of my books. I came across a recipe for garlic ginger bok choy - double score. I was cooking in true Jaden style this night. 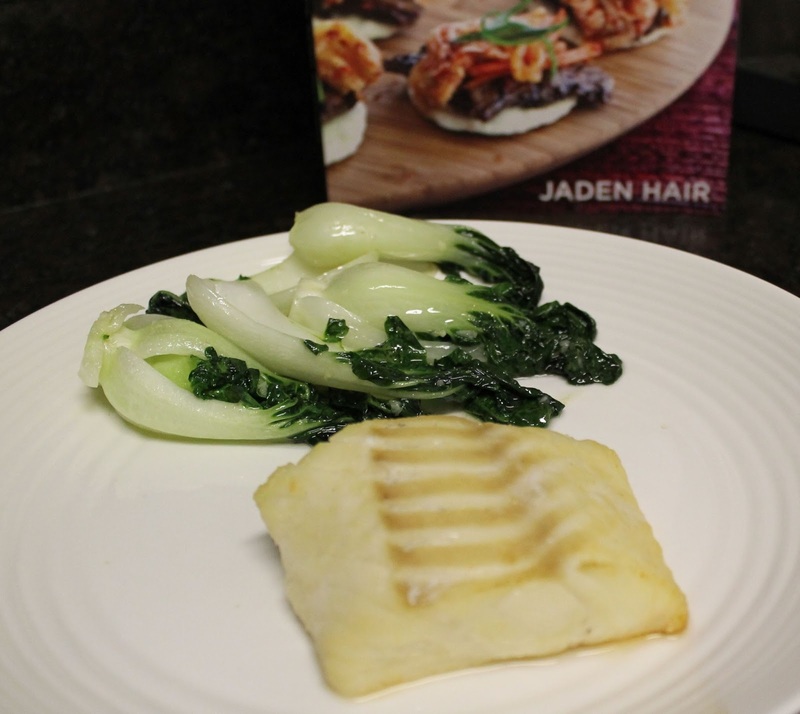 Reprinted with permission from Steamy Kitchen’s Healthy Asian Favorites by Jaden Hair, copyright © 2013. Published by Ten Speed Press, a division of Random House, Inc. Combine the miso, sake, mirin, and sugar in a resealable bag. Mix well. Add the fish fillets to the bag, seal the bag, removing as much air as possible. Massage the bag a bit, spreading the marinade all over the fillet. Refrigerate for 2 hours or up to 2 days. Heat the oven to 400°F. Line a baking sheet with parchment paper. Remove the fish from the marinade and use a paper towel to gently wipe off any excess marinade, but don’t rinse the fish. Discard marinade. Place the fish in the prepared baking sheet and bake until the fish flakes easily, about 10 to 12 minutes. Move the fish to the top rack and place 6 inches from heating element. Turn oven to broil to brown and caramelize the fish, about 1 minute. Keep a close eye on it as it will burn easily. Serve immediately. So you want a copy of Jaden's book too? 1. Tell me what your favorite Asian dish is in a comment below – AND – with your twitter handle in the comment. Comment must be posted by 8pm Eastern time today (Sunday, March 10, 2013). 2. Join in the conversation during the live #SundaySupper chat on twitter from 7 to 8pm Eastern Time today (Sunday, March 10, 2013). Your tweet(s) must contain the #SundaySupper hashtag. The winner will be chosen randomly from the eligible entries. The winner will be notified via email. Note: Giveaway open for United States residents only. Contest ends on Sunday, March 10, 2013 at 8pm Eastern Time. Prime Rib Roast with Miso au jus by The Urban Mrs. I was provided with a copy of Steamy Kitchen's healthy asian favorites for my review. All opinions are my own. Your fish look delicious. I like anything with miso. I have never cooked with cod either, but how easy is this recipe? Wow I love it! I'm a big fan of cod and I really like this simple recipe. Just the right amount of added flavor to enhance the goodness of the fish. Wasn't this code recipe just amazing... My entire family just loved it! I've never had cod before...now I can't wait to try it! YUM! I have never cooked with miso or cod either. I'll have to try this! The cod sounds delish. My favorite Asian dish to make at home is BBQ pork steamed buns. I make these using a recipe from an old Martin Yan cookbook. Of fiddlestick! Forgot to put my twitter handle in last comment. So trying again, fave is pork steamed buns. On twitter: @of_books. Sorry about that. Need another cup of coffee. I'll be making this! I already have cod in the freezer and am ready for trying Jaden's recipe. Thanks for sharing. I haven't done a lot of Asian cooking with fish before...this really has me wanting to try my hand at it for a change of pace! Kudos to you for (double-) stepping out of your comfort zone. This sounds so good, it is already on my to-try list! Aren't you glad you know what miso is now? I love that Sunday Supper and Jaden's cookbook is now opening up so many new recipes for everyone. . and I love that you tried a recipe (fish) you have never made before at home. I think that's so awesome! LOVE this!!! What a healthy and lovely recipe! Sounds like the perfect weeknight meal!! Welcome to the world of cod and miso! I love both, and hope you will for years to come, too! I really need to add more fish to my families diet. If only I could get them to agree. This looks like a perfect recipe to test out on them. Yeah, I am not sure I would be able to find miso either :) The fish looks so light and wonderful! I love simple fish dishes! Looks fabulous! I'm not sure if the comment is in time (someone on twitter said to make it by midnight but the directions say by 8 p.m. EST), but in any case, my favorite Asian dish is Beijing eggs and tomato, a homestyle Asian dish eaten for supper more often than not, but I like it for breakfast. It's generally the first dish a child is taught to make in China. blog about Asian foods all year long at http://saucyskillet.blogspot.com if anyone wants more recipe ideas. My twitter handle is MyKitchenandI. Such a cool recipe, I am such a fish fan. My daughter loves cod. I've been meaning to try miso cod and now I have no reason not to try it! So easy and sounds delicous! I love how she uses so few ingredients!